What the what!! It’s me, the Right-Handed Right Hand Man of Crimson Tate hijacking Crimson Tate’s blog for the first time ever! Brace yourselves – this is gonna be fun, gang. When I heard the word that bestie Heather Givans was designing a fabric collection for Windham Fabrics, I knew that it was going to be a hustle and bustle, nonstop, but most of all THRILLING year for her and for Crimson Tate. I have to say that amongst all of the excitement, I feel so lucky that I got to go along for the ride. It has been such a joy to see Heather, as Quiltmaker-in-Chief and owner of Crimson Tate, work so very hard to make Succulents become a reality. Hip, hip, hooray! Three cheers for Heather!! It is BEAUTIFUL, and I am so proud of you! As part of our creative community here in Indianapolis, I was stoked when Heather needed some projects sewn from Succulents to show at Quilt Market. At the time, I was knee-deep in teaching the Aeroplane Bag at the store, so I knew that I wanted to make one from Heather’s fabric! The Aeroplane Bag can be quilted to your heart’s content and serves as the perfect go-to for your carryon luggage. It can even be used to tote a smallish sewing machine! Succulents, meet Sew Sweetness. Let me take one moment to give props to Sara Lawson of Sew Sweetness, who created the Aeroplane Bag pattern. Her pattern is concise, precise, and easy to understand. It is such a fun bag to build… I’ve made more than a few and I’m ready to sew another! Thank you Sara, for the great design and instructions. To be entered to win, you just need to keep following along over the next two weeks and comment on the posts. Easy peasy. If you’re just getting started, no worries! You can still visit past blog posts and play along. Winners will be drawn at random at the end of the hop. So what are you going to make with Succulents?! Any bag patterns come to mind? Let me know – leave your comment below! Oh I would love to make some messengers bags! Love the design !! Beautiful fabric bundle – I’d love to win for World of Charity Stitching, where we make lap quilts and other gifts for seniors and children. Cool bag, David! I think I need to take your class! At the very least, a bow tie will happen… I love her line! Well, and you and heather! I love this bag…..I am always in search of the perfect bag! I adore the bag. Messenger bags would be great but I’m thinking about redoing my back porch. I love this fabric. those fabrics are lovely – I think I’d like to make a tote for me. Imagine going to the farmer’s market with some succulents to show! Hi David, great to meet you. Bucket Bag tote from Shannon @VeryShannon. Super tote from Anna @Noodle-head.com. Totally love All of the succulents . Heather you rock! Beautiful fabric! They would make a wonderful bag, but I would use them for a quilt that my daughter has been begging me to make. Thanks for the opportunity to win and congratulations on your achievement. Was so nice meeting you at QuiltCon! So excited to wear my Succulant tee. Love the bag- I think I need to make one of my own! Great seeing you in the store on Sunday AND seeing the fabric in person!! I’m ready to make the bag, too….and so many other things. Crimson Tate and the entire crew are so inspiring!! Love the messenger bag. I would definitely make one. Beautiful fabric. I am loving this line of fabric. I love the bag, but I am a quilter. Of course that means that I would make a quilt with this fabric if I were lucky enough to win some. I have been thinking of trying a herringbone quilt. I have just begun quilting and would love to make a quilt. The idea of a bag is not too bad either. Would love to win this fabric bundle! I would make a tote and a wall quilt with the fabric. Love David and Heather and Crimson Tate! Always leave with a smile on my face and a project to start! Succulents is such a beautiful fabric, for quilting, clothing or home dec!!! I’ll be making a quilt — pattern unknown as yet. Definitely need some succulents. Aeroplane bag here I come! That bag is fabulous (as is the fabric)! Congrats! 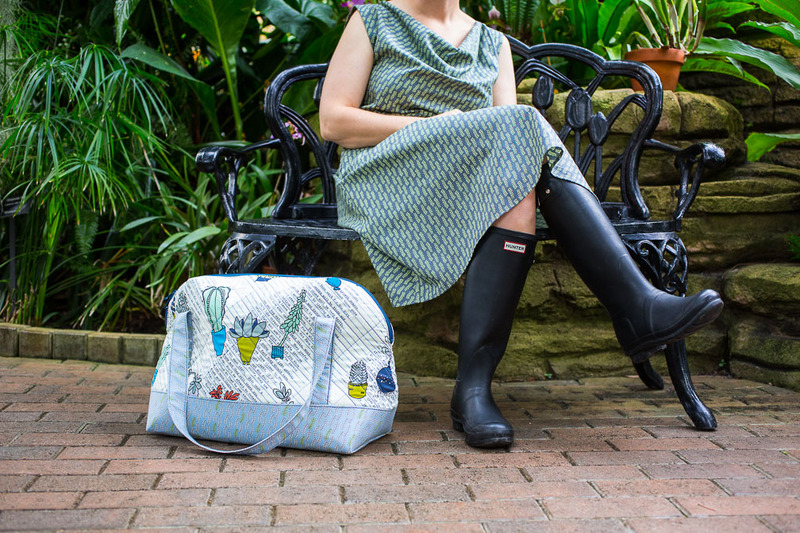 I am all over the Vivian Traveler bag by Swoon Patterns, and I’d love to use some of this fabric for that bag! Thanks for the chance to win! I know it’s not technically a bag, but I would make the Divided Basket from Noodlehead. DB is the King of the Aeroplane Bag! What what! Very cool fabric. Of course the bag looks really cool made up in it too! I’d shamelessly copy your aeroplane bag! Love that airplane bag!!! Would love to make that and a quilt for my gardening friend. Thanks, David!! I’ve never made any bags before, but I’m thinking that aeroplane bag needs to go in my queue. My hubby and I love to travel! Wow, what a fab bag. I am a beginner so still at the tote bag stage but have lots of ambition and ideas!! I’ve been wanting to try the Sew Together bag that everyone in blogland seems to be making. I purchased the pattern and would love to try it with this collection. Thanks for the opportunity to win! This bag is lovely! I just got a new bag pattern from Clover & Violet and would love to use this line! Thanks! This fabric is gorgeous. I’m definitely going to use it in a quilt. Thanks for the chance to win! Succulents will make a great topper for my kitchen table. I’m thinking the border of succulents arranged in a square – pattern developed as I go! Love this bag…I think this will be my year to make a bag! And since I’ve grown up in my mom’s jungle of jade and aloe and now have plenty of my own….Succulents it is! id love to make some fabric baskets what a cool fabric line! I think this line would work great with either a Super Tote by Noodlehead, a Divided Basket by Noodlehead or Clover and Violets Pepper Tote! (I would probably go for the divided basket before anything else) Thanks for the chance! I would like to make a Weekender Bag by Amy Butler. The fabric would just be perfect! Oh I want to make a market tote out of this fabric! I also want to learn this aero plane bag, way beautiful David!! I would love to make a lap quilt with these fabrics. They are so beautiful! Love the travel tote in your pic on the blog. Love this fabric line, too! Thanks for the givewaway. I SO need to make a trip to Indy and see these beautiful fabrics. Love the bag!! I think the bag is so much fun with this fabric! Love the fabric and the bag. Thanks for blogging David! Way to go on your beautiful fabric Heather!! I love Sara’s Aeroplane bag too. And I would love to make some cosmetic pouches out of this delightful fabric. Thanks for the chance to win! I grow succulants, would be fun to quilt with them! Love that bag! I’ve always wanted to make the Amy Butler Weekender bag. Thanks! Somehow I missed this response, so thanks for the email! Such pretty fabrics! I have a duffel bag pattern that I’d love to make using Succulents. I need to get that pattern. Do you havecat the shop? I love the Aeroplane bag, but I don’t know if I would be able to make one. Maybe if I win a bundle of Succulents fabric, I need to just buy the bag pattern and make one! Thanks for the giveaway. Oh, I’d love to make a lot of things with this bundle! One thing that tops the list is a lovely light-weight quilt to sit on the porch with this summer after the sun goes down and it cools off. Once in a while a little quilt is needed to stay cozy! So very pretty. I would like a picnic quilt. I love the fabrics. I would love to make a bag. Beautiful bundle. I am thinking a table runner would be nice. I just got an Anne Handbag pattern from Clover and Violet, that would look great make with Succulents! I’d make a quilt or little girl dress with the fantastic border prints. Love the bag, David! Love you guys, and am planning a trip up to CT ASAP! oh this fabric is wonderful! and Iove the bag! I would make a tote bag for my daughter’s birthday. I want to make Noodleheads new trail bag. Great line of fabrics! I would love to make a bag for quilting supplies from them. Thanks for the chance! I love the bag! This fabric is SO pretty – and versatile too! I pick up my Wallflowers quilt pattern and yardage from this beautiful new line yesterday- can’t wait to get started on it over spring break! Gorgeous fabric! Gorgeous bag!!! I could definitely see a nice bag in this collection for myself….that is, if my daughter’s didn’t snag it up! 😉 But I love to sew dolls, so can also see it used that way. Thanks for the hop and the giveaway! Ohhh, that fabric would totally turn into a quilt. Love the bag! I have this giant bag that I love, but I think I need another one. This would be perfect. I just bought the Green Bee Boxcar Tote pattern and it’s great for featuring several large prints. The Succulents fabric would be perfect for it. Thanks for the chance to win. I like making big, roomy bags and yours is perfect. Thanks for the chance to win. Such a great line of fabric – absolutely love the text fabrics! Never even thought of a bag with these lovely fabrics…will have to check out this airplane bag pattern! Love this fabric- it lends itself to so many different projects, and being a gardener, opens up even more! I’d either make a quilt, or a bag and some pillows! I think a big ole honking purse would be great from Succulents. I’d also make some cool pillow cases from it. Thanks for the buttons at Quiltcon David. It was great to meet you!! Would love more of these babies since I am not sure I will find them in Canada but here’s hoping. I would make LOTS of springy quilts! Beautiful fabrics! I love the airplane bag made in the Succulents fabrics. I’d like to make myself a drawstring bag using the blue border print! I’d make a bag…or two…or three! Thanks for the giveaway chance. I love this line of fabric! Thanks! I think I’d make a sewing machine cover with this line! I would like to make some dumpling pouches with this fabric, some would be great for fussy cutting! Thanks for the chance to win. Looking to make either a messenger or sling bag with a small wristlet. I love the new fab fabric! I want to make a miniature quilt and who knows what else from there! Cool bag! great idea for this fabric — I should try this pattern! These yummy fabrics would be perfect for just about anything! I’d make some totes for sure — and then I’d also make a quilt or two. These fabrics are beautiful!! Finally plants that I can’t kill!!! As for pattern I these fabrics would be awesome made into the “Two hour tulip purse” pattern!! Haven’t tried a zipper on a bag yet or even a button hole but I would love to make A quilt. As much as I love tote bags you would think I would make myself a few but not me. Now I really like your bag and I am inspired to work on one for myself. Thanks for the inspiration. I’d love to make an Aeroplane bag too!! I am thinking a quilt is in order, but also think a Noodlehead cargo duffle would be great in this line? I would make church bags for my kids. I’d put the fabrics into a quilt since I’m not really a garment sewer. love love so pretty and such a generous offer! I’d love to make a quilt with this line! 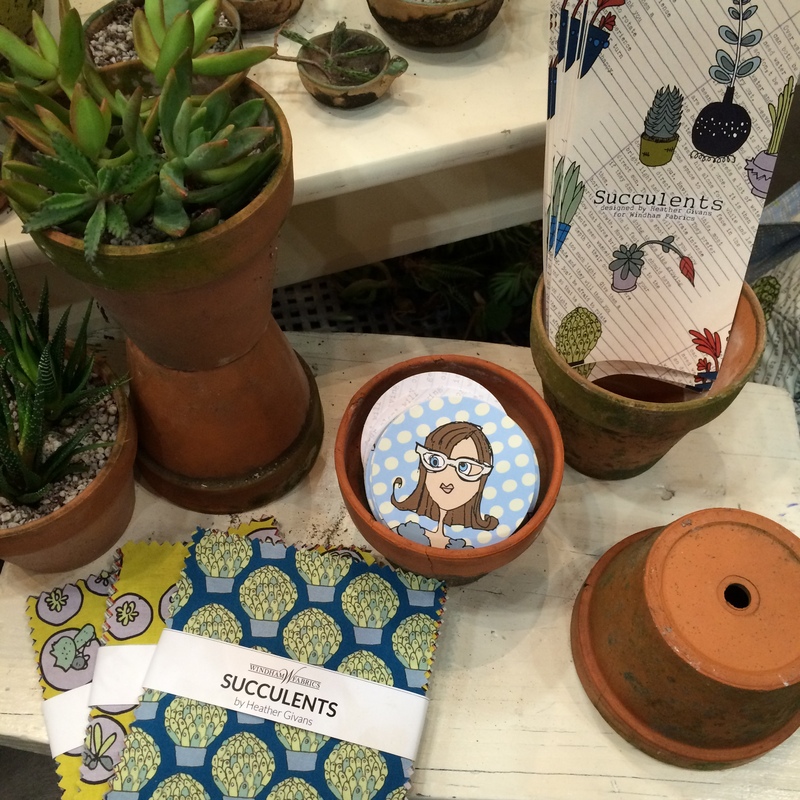 Thanks for the chance to win the beautiful Succulent fabrics. I am enjoying looking at all the projects everyone has made. A great start of fabrics to win to make a lap quilt for the sofa. One of the Noodlehead totes maybe? I will really want to try to make one of those hexie echoes that Heather did for her quilt, maybe keep the idea small for a bag panel? I’d love to make a Weekender with it! I would love to make a hexie quilt with the fat quarter bundle! But, there are only like 5 million bags that would look fabulous in this line!!! I’ll definitely be getting some succulent fabric to make some totes but they will all be of my own design. I must admit I rarely if ever buy patterns, I prefer just to design my own as I go along. Thanks to the chance to win. I’d love to make a hexie quilt with the fat quarters, but then there are also 5 million totes that would be fabulous too! How about a tote/bag for hand piecing? I think it would be lovely worked up with the fabric! Thanks for the chance to win! oooh, a Caravan tote by Anna Graham would be great in these! Ooh I’d love to make 241 tote with this collection! I Also love Sew Sweetness pattern but I need to gain confidence in bag sewing! I would love a tote with this fabric. I am in love!!! like that before. So good to find someone with genuine thoughts on this issue.